Europe Warm Edge Spacer Market size for 2016 was valued over USD 100 million and is set to exceed over 550 million meters by 2024. Growing measures to improve energy efficiency of building envelope by renovating or replacing existing windows with advanced efficient ones will stimulate the warm edge spacer market size over the forecast timeline. Reduction of heat loss and condensation, noise insulation, and diminishing overall electricity cost are some of the features which makes it preferable over available traditional products. European standards BS EN 674 and BS 6262 are applicable for building glasses to limit thermal transmittance and glazing in buildings provide better insulation practices. Shifting trends towards energy conservation with rapid industrialization and urbanization will boost the warm edge spacer market share by 2024. Adoption of these products assists in checking window sealing’s energy losses by delivering high thermal insulation, enhancing the cost saving index. According to Energy Performance of Buildings Directive, European Commission mandates member countries to follow marginal power consumption and new buildings must function on ‘nearly zero energy’ by 2020. Stringent regulations to reduce carbon footprints coupled with growing demand for Energy Efficient Windows Market will encourage the warm edge spacer growth. Residential and commercial buildings are prime contributors towards CO2 emissions and constitutes for about 20% of GHG discharges. In 2014, the European Commission (EC) introduced Energy and Climate Framework with the aim to increase focus towards sustainable technologies to reduce GHG emissions by over 40% by 2030. Warm edge spacer market for 2016 from flexible spacers accounted over 25% of global share and is forecast to witness significant growth owing to ease of use in production, moisture penetration and gas leakage resistance. These products comprise of non-metal, structural foam system having improved U-Value, reduced sealant stress, better noise reduction and warmer sightline. Flexible spacers are produced by modernized processes in response to expanding industry coupled with increased output and slashed labour quantity. Stainless steel warm edge spacer market size is set to witness substantial gain on account of its better condensation capacity and enhanced UV protection ability. Reduction of energy consumption and optimum desiccant filling coupled with improved thermal performance h makes it preferable over conventional spacers. Warm edge spacer market share from residential applications are projected to grow over 12% by 2024. Growing measures towards UV radiations, temperature performance, environmental degradation and green building impacts will positively impact the industry growth. As per EU directive 2012/27/EU (EED) for energy efficiency, consumption in buildings should be reduced and public owned companies should be renovated to curb power usage in buildings. Commercial warm edge spacer market size, in terms of volume, is set to exceed over 100 million meters by 2024. EU aim towards zero emission buildings by 2020 will complement the industry outlook. As per EU Energy Labelling Directive, it introduced a maiden approach to label and classify windows rated to deliver maximum effect on energy consumption. Warm edge spacer market volume from double glazing is anticipated to grow over 14% by 2024 on account of its easy installation, economic viability and high thermal insulation. Installation of these products in new and existing windows improves the overall U-factor, noise insulation and deliver reliable thermal performance. Triple low-E warm edge spacer market contributed to over 35% of regional revenue in 2016. 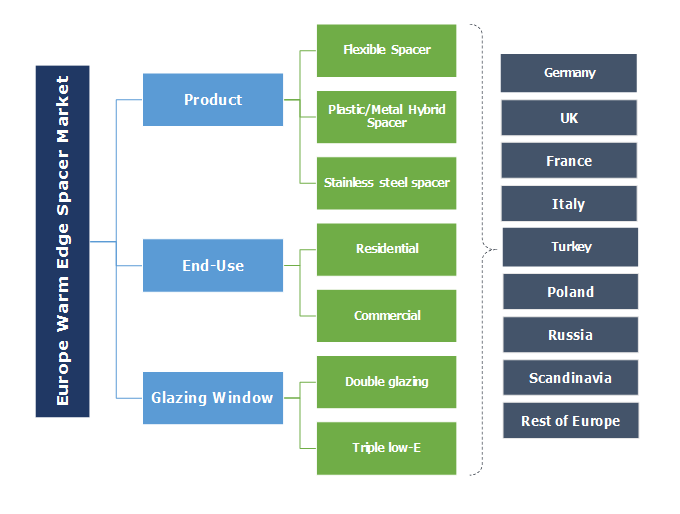 According to IEA, penetration of triple glazed across the Northern Europe countries in 2014 was more than 20% when compared to Southern, Western and Central Europe where its less than 10%. The Government of UK is strategizing to achieve zero carbon buildings with the installation of triple glazed windows in the new buildings. UK warm edge spacer market share in terms of volume is anticipated to growth over 12% by 2024. In January 2017, UK Department of Business Energy & Industrial Strategy reported that window glazing can result in up to 72 GWh of estimated lifetime power saving. It also reported that the government targets to conserve low cost energy efficiency and aims to insulate million homes over the next five years. Poland warm edge spacer market size in 2016 was over 20 million meters. Polish government introduced a thermo-modernization plan for refabricating the windows, walls and roofs insulations and keep check on thermal transmittance of building envelope. Favorable government initiatives including subsidy and tax rebate on energy efficient product will further complement the business landscape. Italy warm edge spacer market for 2016 accounted over 6% of regional share. Introduction of building regulations with aim to reduce emissions coupled with initiatives towards energy conservation will foster the business growth. Europe warm edge spacer market participants include ALU-PRO, Ensinger, Hygrade, SWISSPACER, Technoform Glass Insulation, Allmetal, Glasslam, Cardinal Glass, GED Integrated, Edgetech. (Quanex), Helima, Kömmerling, Fenzi, Thermoseal and DGS. Warm edge spacer market has witnessed the pace to innovate new technologies and its smooth application among companies to expand their presence inevitably. For instance, in November 2016, the DGS Group Plc introduced new range of products, Multitech to its catalog setting new standards for ease-of-fabrication, energy efficiency, and processing. The product is IFT certified to offer the lowest thermal conductivity than any currently available systems. The extension of the product range will propel growth of DGS in the European industry. The warm edge spacer products are a vital part of energy conservation and environment friendly buildings. Different regulatory forums and governments are validating the adoption of low GHG emission and power saver buildings. The technology caters to construction of windows boundaries with a double or triple glazed unit to perform as less heat conductor or cold than conventional windows and purpose to diminish this energy loss. The growth of the industry is attributed to high penetration of products, strict government standards, inclination towards UV protection measures and thermal insulation with low emissions.